Thank you for all who attended this months meeting. The slides can be found on the Presentations page. I hope the information was helpful. If you have any questions, please feel free to come and talk to the presenters. Well, we made it through the holidays, skipped January all-together and landed in February. Sorry for missing a month, but coming back from a shutdown the same week the meeting is scheduled… well, I think it was too much for any of us. Todd sent out a broadcast email to make sure everyone knew we had this club in Tustin. I’m really glad we did, as we had some new faces and it’s always great to make some new friends that have similar interests. So a great big WELCOME to the new folks! We made some announcements regarding fun shoot dates and they have been posted on the Calendar. Dates that are currently scheduled are May 23rd, July 25th and September 26th. These are subject to change and we’ll keep the calendar and posts updated as necessary. It was suggested to have a weekday shoot… seems like there was a positive response to this… what better way to spend a vacation day. So we will be sending out an email and trying to get a date firmed up. Jed was nice enough to provide a some information on the Orange County CCW process. If you are interested in applying, everything you need to know is on the OC Sheriff’s Website. 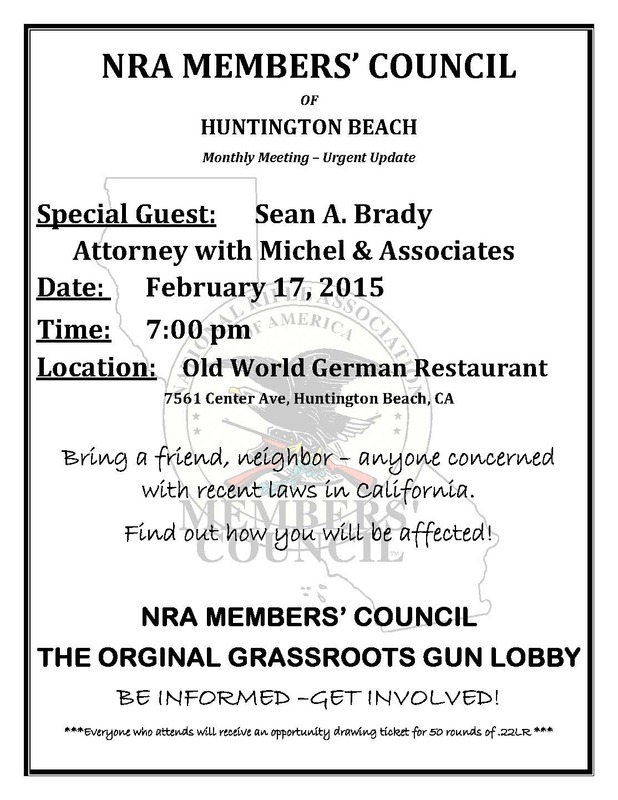 Lastly, there is a meeting coming up next week for the NRA Members’ Council of Huntington Beach. Everyone is welcome. Yeah, I know it’s February, and we just had our first meeting of the year… but it’s been busy and I’m just now catching up with the December meeting. We all know that Todd has alot of information rattling around in that brain of his. He was nice enough to put slides together and give us a history of the AR-15. This will actually be a series of talks, that will include building an AR. This will likely be spread out a bit because of the prepartion time needed… but we’ll get to them. If you missed this meeting or wanted to look back at the slides, they can be viewed here. Also, I updated the November post with the website for the NRA Members’ Councils of California (provided here as well). Hi folks! I always look forward to seeing everyone at the monthly meetings. This month was a real treat with James Ma joining and discussing the NRA and the efforts in California. It was very informative and I was happy to find out the attention that California gets. The California Members Council of the NRA is a unique organization of the NRA. I encourage everyone to go out and take a look at there website to find out more. With James being actively involved in these very important matters, he has volunteered and we will call upon him for future meetings to keep us updated. Thank you James! Always call and verify the date/time. Minimum requirements to participate: 150-200 rounds (just to be safe) gun holster magazine holster 4 magazines eye and ear protection $40.00 entrance fee. call a week in advance to secure a spot.